The terraced temple of Hatshepsut at Deir el-Bahari is a million-year house. The temple which was completely built from limestone is like its older neighbor, the mortuary temple of Mentuhotep II Neb-hepet-Ra (founder of the Middle Kingdom, 11. Dynasty around 2000 B.C..; see also Location of the Building), an unusual creation of Egyptian temple architecture. Instead of the usual consequence of 1. pylon - > courtyard - > 2. pylon - > - column hall the building is structured by a sequence of terraces, whose front of columned halls (porticos) open directly to the east. 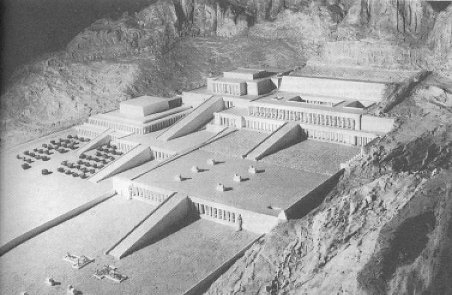 The temple of Hatshepsut resembles in certain elements the mortuary temple Mentuhotep, differs however from this by the separation of the royal tomb from the temple. The royal tomb of Hatshepsut, KV20, lies not far from her temple but was attainable only by the Valley of Kings (see also 2. photo under Location of the Building). From the Valley Temple, from which little has survived, a processional way about 37 m broad led to the temple Djeser Djeseru. The processional way consisted of a paved road approx. 6 ms wide which was lined on both sides by a row of sphinxes. Due to the number of preserved bases approx. 70 sphinxes had been lined up along the road with a distance of about 17 m between each of them. 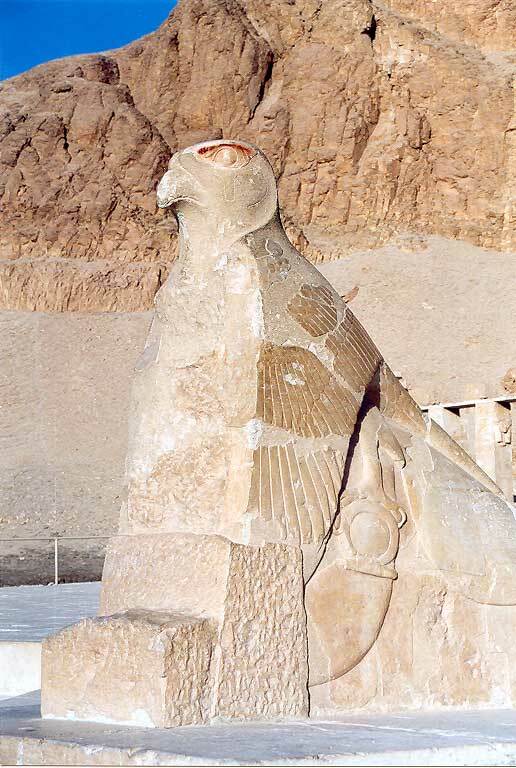 These sphinxes carried on their lion body the head of the queen most likely with a different head-dress. They had been carved in sandstone from Gebel es-Silsilah, some fragments have been found in 2005 inside the tomb of Harwa (TT37). For instance on half distance a bark station was built from but nearly nothing of it has survived. The processional way was like the entire temple enclosed by with a wall. The processional way ended at a great courtyard (= 1. terrace) in which a garden with papyrus planted in basins was built. The western side of the courtyard is formed of two pillared halls (1st portico). Between the two pillared halls the 1st ramp leads to the 1st terrace. In front of the 1st ramp still remains of t-shaped basins planted with papyrus can be seen (see drawing of the reconstructed temple below). The row of sphinxes was continued on the 1st terrace however here in the middle courtyard they were most likely made of granite. The description of Garden and Pools is presented on a separate page. Each portico consists of a two-row colonnade which supports the ceiling. In the lower, 1st portico, the outer row is built of pillars which are square on the outer side but rounded on their inner side (see also Building Phase II). The inner row is built of 16-sided columns. The exterior of the pillars of the 1st portico was decorated (see the following illustration) however only on two columns of the northern side of the portico (Hall of Hunting) remains of the decoration have survived. An important element of the decoration was formed by two colossal statues of Hatshepsut placed at both outer ends of the portico. From the original decoration of the pillars exteriors there are two well-preserved examples to be seen on 2 pillars of the northern wing of the 1st portico. 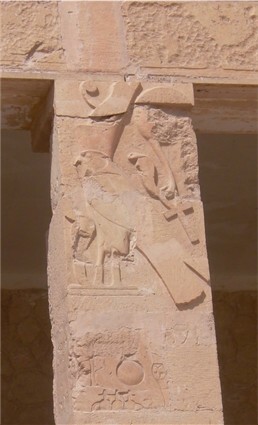 The two pillars each show a palace facade on which a falcon who is crowned with a double crown (see left) is sitting. 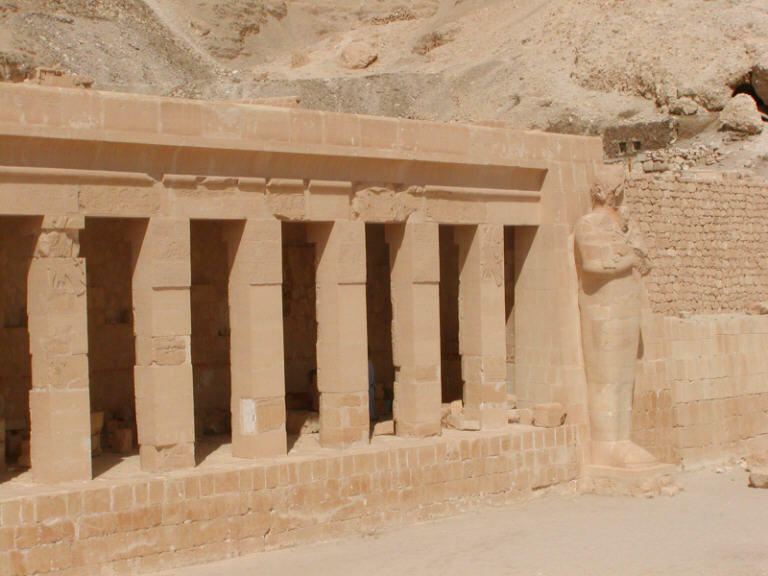 The photo below shows the colossal statue of Hatshepsut at the end of the northern wing of the 1st portico. The ceiling of the 2nd portico is also supported by two rows of square pillars. On all four sides of each pillar Hatshepsut - embraced by Amun - was depicted. Only on every fourth pillar Thutmosis III appeared in the same scene instead of the queen. 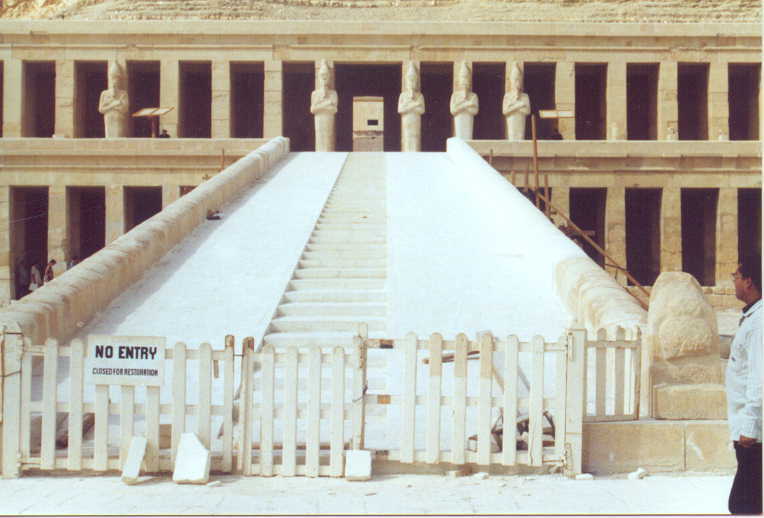 The pillars of the 2nd portico carry not only the portico of the upper terrace, but also the statues of Hatshepsut standing in front of them. 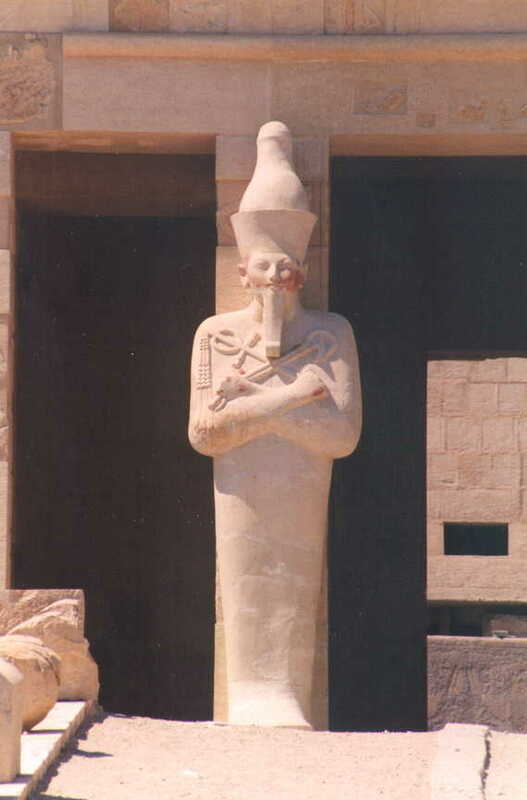 From these statues, however, only few are preserved, probably the most of them were already destroyed in the times of Thutmosis III and "buried" in the proximity of Djeser djeseru. When they were discovered by chance - just the first Egyptologists excavating at Deir el-Bahari had put their debris just over them - many of the statues showed as the other monuments of Hatshepsut clear traces of destruction e.g. the attempts to make the face unrecognizable by destruction. 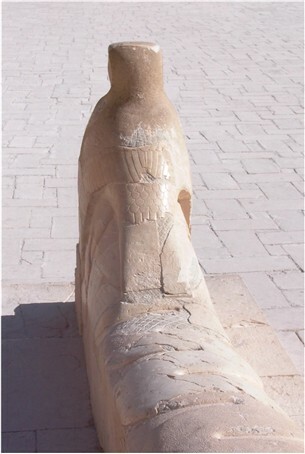 Above one of the statues of Hatshepsut standing in front of the portico of the 3rd terrace. The terraces are, as already mentioned, connected by ramps with each other. In the middle of both ramps a central row of stairs lead upwards (see also the following photo of the upper ramp). The balustrade of the upper ramp is formed on both sides by a cobra (a "Wadjit"-snake). The heads of the cobras form the lower ends of the balustrade. On both cobra-heads cobras a Horus-falcon is sitting (see photo below). This is an allusion to the legend of Osiris in which a cobra protected and nursed the infant Horus - thus "carrying" him - while he hided himself from Seth in the Papyrus-jungle of the delta. The lower ramp has a "balustrade" without further decoration, the ramp heads showed on both sides in sunk relief a lion which, however, is preserved only on the interior side of the left - southern - balustrade (see photo below). 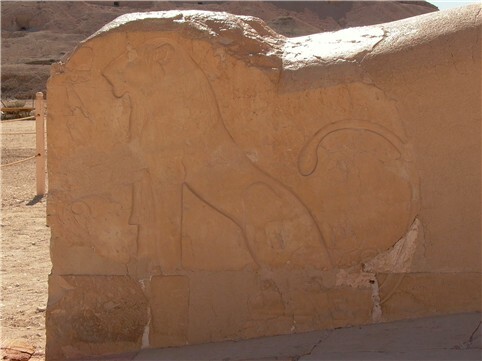 Probably, these pairs of lions symbolized the guards at the "Gates to the horizon". 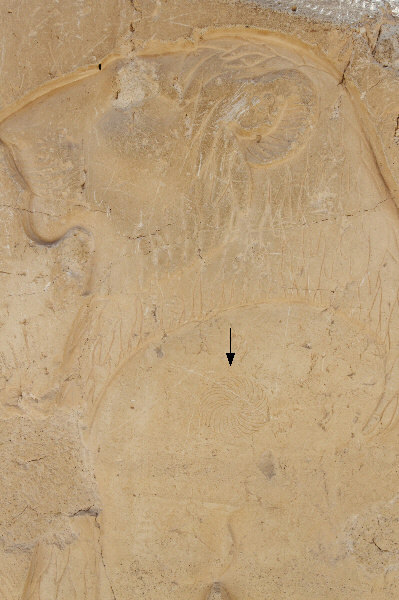 A closer look shows that the lion exhibits an inconspicuous hair whorl at his shoulder (see arrow). This hair whorl is interpreted as an characteristic feature of a young lion (see Budde, D., Zur Symbolik der sogenannten Schulterrosette bei Loewendarstellungen. ZAES 127, 2000, 116-135). 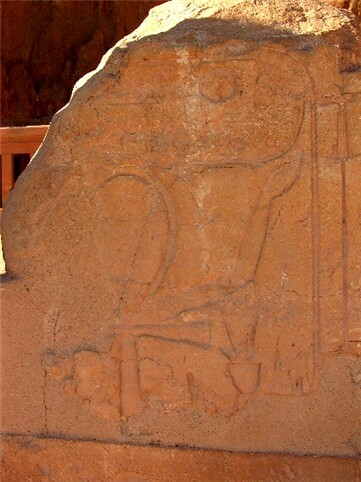 The front end showed also in sunk relief a large Ankh-sign that, with human arms, held up a cartouche with the name of Hatshepsut. Also this decoration element is preserved only on the front end of the southern balustrade (see the following photo). In order to keep the download times short I divided the pages about the porticos. The links above lead to the corresponding pages. From there you can either jump to the next portico or jump back with the one of the links shown below (which are available on each page).